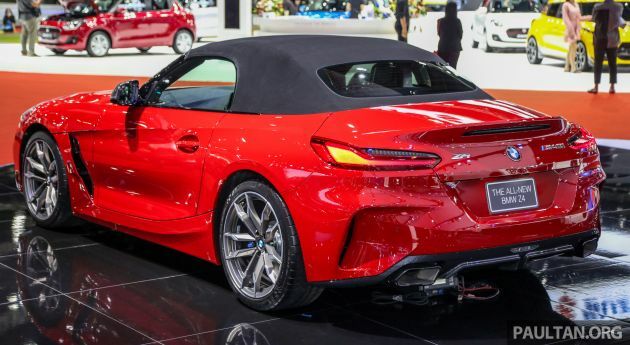 BMW showed off the G29 BMW Z4 at the 2019 Bangkok International Motor Show. The third-generation roadster was launched in Thailand last month along with the latest G20 BMW 3 Series. At Impact Muang Thong Thani, the BMW sat just a stone’s throw away from its famous platform sister – the fifth-generation A90 Toyota Supra. The new Z4 is available in the Land of Smiles in two variants – the sDrive 30i in M Sport trim and the M40i performance flagship, priced at 3.999 million baht (RM510,533) and 4.999 million baht (RM638,199) respectively, inclusive of the BSI standard package. The Z4 30i is powered by a 2.0 litre turbocharged four-cylinder engine with 258 hp and 400 Nm from 1,550 to 4,400 rpm. Power goes to the rear wheels via a ZF eight-speed sport auto gearbox. The 0-100 km/h sprint is completed in 5.4 seconds while top speed is electronically capped at 250 km/h. The M40i that you see here isn’t just more expensive by one million baht, its straight-six engine is one litre larger at 3.0L. With 340 hp and 500 Nm of torque from 1,600 to 4,500 rpm, the M Performance Z4 – which comes with Launch Control and an M-specific shift pattern – does 0-100 km/h in just 4.5 seconds. Standard kit includes the M Sport exterior package, adaptive LED headlights, 19-inch double-spoke alloys, keyless entry, powered seats with driver’s side memory, Vernasca leather, dual-zone climate control, Variable Sport Steering and the BMW Live Cockpit Professional system. The M40i receives adaptive M Sport suspension, M Sport brakes, an M Sport locking rear differential, Sensatec faux leather dash, M Sport seat belts and a Harman Kardon sound system. The Z4 is imported from Austria, where it is made by Magna Steyr along with the Toyota Supra. All things (engine and price) being equal, would you have this German roadster or that Japanese coupe? Both will be coming to Malaysia in the near future. The post Bangkok 2019: G29 BMW Z4 launched, from RM510k appeared first on Paul Tan's Automotive News. 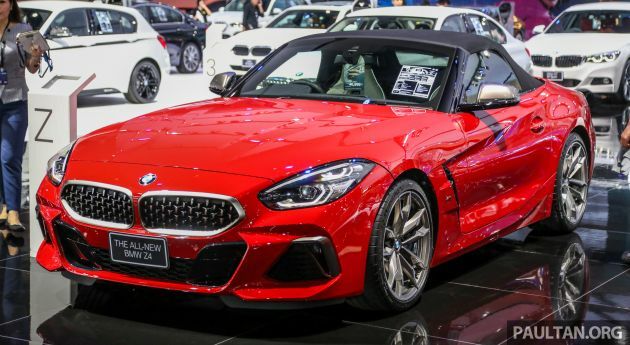 0 Response to "Bangkok 2019: G29 BMW Z4 launched, from RM510k"